True or False? At one time, it was legal to mail babies through the U.S. Postal Service. True. On January 1, 1913, sending packages via the U.S. Parcel Post Service began. Regulations stated that packages could not weigh more than fifty pounds. The service was not intended as a means to ship children, but there were a few instances when it happened. Although the photo above was supposedly staged as a joke, the following stories recount some real cases of children being shipped. Vernon O. Lytle, mail carrier on rural route No. 5, is the first man to accept and deliver under parcel post conditions a live baby. The baby, a boy weighing 10-3/4 pounds, is the child of Mr. and Mrs. Jesse Beagle of Glen Este. The boy was well wrapped and ready for mailing when the carried received him today. Mr. Lytle delivered the boy safely at the address on the card attached, that of the boy's grandmother, Mr. Louis Beagle, who lives about a mile distant. The postage was fifteen cents and the parcel was insured for $50. Mrs. E.H. Staley of this city received her two-year-old nephew by parcel post today from his grandmother in Stratford, Oklahoma, where he had been left for a visit three weeks ago. The boy wore a tag about his neck showing it had cost eighteen cents to send him through the mails. He was transported 25 miles by rural route before reaching the railroad. He rode with the mail clerks, shared his lunch with them and arrived here in good condition. On February 19, 1914, the parents of four-year-old May Perstorff mailed her from Grangeville, Idaho, to her grandparents in Lewiston, Idaho. Mailing May was apparently cheaper than buying her a train ticket. The little girl wore 53-cents worth of postal stamps on her jacket as she traveled in the train's mail compartment. After hearing of such instances, the Postmaster General issued a regulation forbidding the sending of children in the mail, stating that "children did not come within the classification of harmless live animals (bees and bugs) which do not require food or water while in transit." Although these examples were misinterpretations of the purpose of the post office, they do attest to a time when travel was difficult for most people. They also reflect the trust people had in the mail carriers to take care of their most valued possessions, their children. If it were legal, would you mail your child today? Marilyn, I've just been researching this very thing. I have a short story based on these incidents in Guideposts' upcoming A Cup of Christmas Cheer collection. 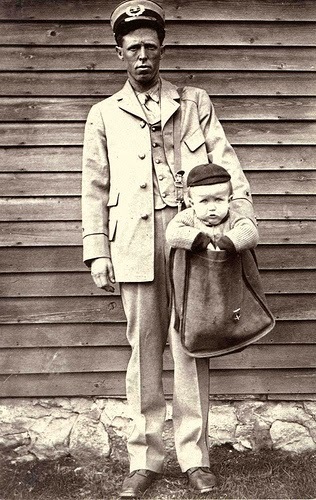 My grandfather used to work on a railroad mail car between Portland and Bangor, Maine, but it was after they banned mailing humans, so he was never asked to carry a child along. The Smithsonian Institution's Postal Museum blog has a lot of interesting information. Thanks for a fun post! Hi Susan. When I was asked to come up with a story for this year's CCC, I couldn't think of one. Too much else on my mind at the time and too short a notice. What a good idea! I saw this on Facebook a while back and had to check it out. Thanks for your comment. Look forward to reading your story. What an interesting and disturbing practice! I can't imagine doing that with my child. It does make an intriguing subject for a story! Hi Rebecca, Yes, guess these parents believe the mail carriers would take good care of their children. Strange, though, isn't it? My answer is a definite NO! What a scary thing, but I know times were different and people as a whole were more responsible 100 years ago. Great topic! Vickie, I agree. There are very few people I trust with my grandchildren. My own children are grown, but one cringes at the thought of all the creepy people out there. Oh my goodness! I cannot fathom doing this, although as Vickie said, times were different then. Perhaps if one knew the postman, and it was more like simply escorting the child a few miles. Of course, today we do put a child on an airplane in the care of a flight attendant. Our grand-daughter came to visit when she was about 12, and I was to meet the plane. The airlines was not going to let me through security to meet her. I told them that my grand-daughter was on that plane, and I had told her I would be at the gate to meet her. That was before 9/11, and they did let me through. I think they knew they would have had an irate grandmother on their hands otherwise! Interesting post. Hey Golden. Yes, I thought about sending children on planes. But I don't know what the current rules are about that. Maybe they changed after 9/11. Thanks for the comment, Britney, and for sharing. Now you can threaten to mail your children away if they misbehave!